Sold by Lausonhouse AU and Fulfilled by Amazon. Gift-wrap available. 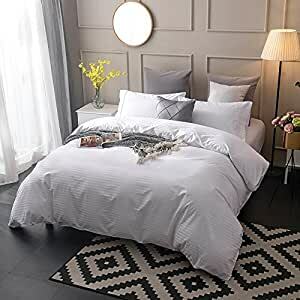 100% Cotton Sateen 300 Thread Count Duvet Cover Sets, machine washable. Lustrous, Long Lasting understated sheen in sateen weave,both simple and fashionable. This bedding is is well-crafted, high-end pure linen Quilt Cover Sets and bedding for the home. From the moment you touch this luxury linen bedding, you will feel instantly comforted and content knowing that you have dressed your bed in stunning linen. Linen is a textile made from the fibers from flax plant.France and Belguim are considered the best climates for growing the flax plant, our linen use the purest flax fiber from France. Nothing compares to sleeping in linen. Cool in summer and cosy in winter, this lovely linen fabric has a super soft handle that only gets better with age. Our beautifully simple duvet cover and pillow case have a relaxed look and feel. Each piece in the range is lovingly hem stitched with high attention to detail, resulting in an elegant, simple and luxurious piece of bedding. These pure linen Quilt Cover Sets have been pre-washed, which is a technique that softens the fibres to give you bedding that has a beautiful delicate texture and elegant drape as it’s worn on your bed. NOTE: Machine wash cold on gentle/delicate cycle.Tumble dry on low heat. Do not bleach. Iron on low heat when needed.